Contemporary Arts International (CAI), also known as YV Art Museum (WHY WE Art Museum)announces the solo exhibition of paintings and sculptures by Chang Chia-Ming. The exhibition is entitled “FLOWER and STONE”, it will display 19 large and medium scale paintings of flowers and 20 delicate granite sculptures. An Opening reception will be held on October 14, Sunday at 2:00PM. CHANG CHIA-MING is an outstanding painter and stone sculptor from Taiwan. As the Title of the show indicated Chang is a multi-faceted artist; not only has he mastered stone carving, he is also a serious painter. It seems that the subjects and media Chang choose to present in this show are the two extremes in the field of both 2D art and 3D art, “soft” as creating the fragile, short-lived flower by paint brushes, “hard” as holding the heavy air tools, electric grinders and chisels to the strong, long-lived stone. Chang was invited by the Museum/CAI at first as a stone carver to participate in the CAI’s New Art Archeology program, during the 3-week Stone Carving Symposium he carved a 10-foot tall, 6-ton monumental granite sculpture. 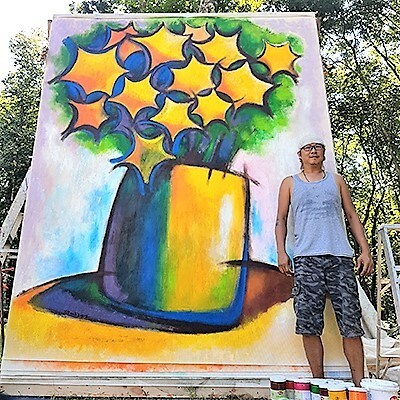 After the completion of the Symposium, Chang started to paint flowers in reaction to the environment surrounding of the Museum’s sculptural grounds. His sharp observation of the subtle colors hidden in this dense forest, and the colors of the man-made sculptures on the grounds comes out on huge canvases. He sets up his 10 feet tall canvas frame in the woods next to the big stone pile. He paints from dawn to dusk and lets the daylight gradation speak to him throughout the day. His elevated spirit and supreme inspiration has evidently shown through the painted flowers. Chang’s artwork associates profoundly to the figurative and its social implication. His composition lingers on the edge between abstraction and concreteness. CAI’s admission fee is $5 for students/ seniors and $10 for adults, which will include a tour of the studio and the sculpture park. For more information, visit our website at www.contemporaryartsinternational.org.